It’s a beautiful thing when a place lives up to its hype, isn’t it? I’d heard great things about Andaz Scottsdale Resort & Spa long before our visit – about the cool, mid-century design that somehow manages to stay true to its Sonoran Desert roots; about its unique partnership with the nearby Cattle Track Arts Compound; and, especially, I had heard nothing but rave reviews about the resort’s signature restaurant, Weft & Warp Art Bar + Kitchen. 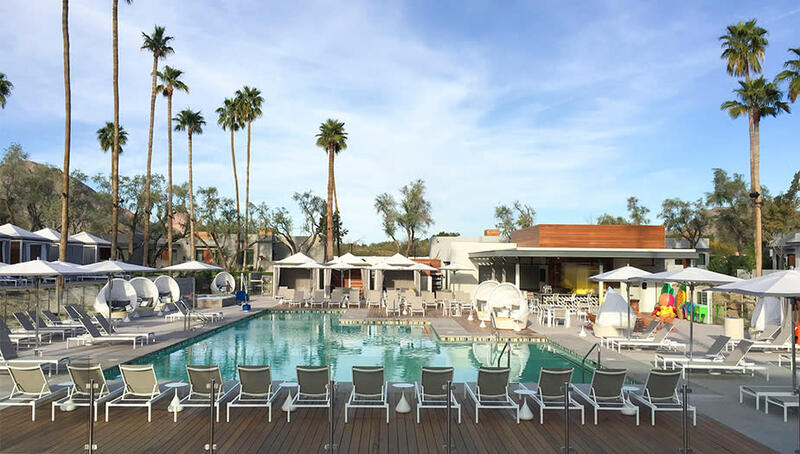 The resort itself is comprised of 201 bungalow-style guestrooms and suites, their white exteriors a dramatic contrast to the surrounding Saguaros and desert wildflowers. Maybe it’s because I get strangely excited about such things, but one of the first characteristics I noticed about the resort’s setting was the towering 50-foot pine trees that dot its landscape, which the developers purposefully worked around in order to preserve. All of this, coupled with eye-level views of Camelback Mountain, practically stopped me in my tracks. You check in at “The Guest House,” where there’s no obvious front desk (I was confused for a hot second) and the expert staff casually (but warmly) greet you upon entrance. This is where I got my first real taste of that mid-century modern design everyone was flipping for – clean lines mixed with eye-catching geometric patterns mixed with neutral wood tones mixed with just the perfect pops of color. The look is sleek and beautiful but still casual and completely inviting. 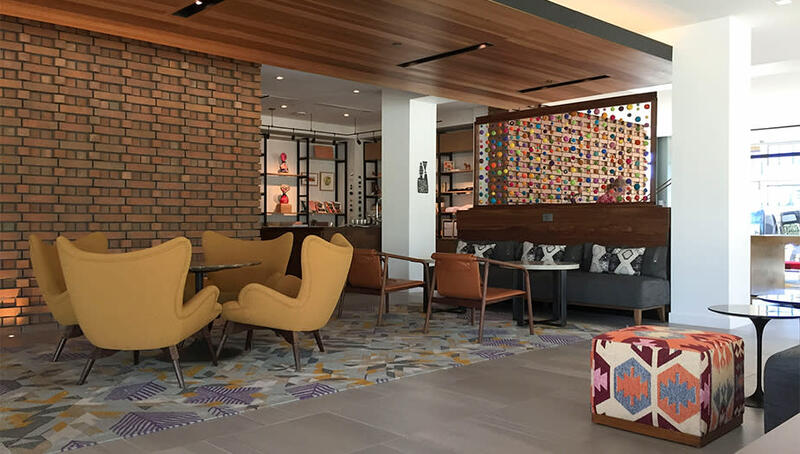 All around Andaz Scottsdale – from the common areas to the private guest rooms – you’ll find the same combination of bright colors, folk art and cultural patterns that draw inspiration from the creative set of the 1950s and 60s (a la Alexander Girard). It’s desert chic done just right. But what makes the resort especially unique is its partnership with the local craftspeople behind Cattle Track Arts Compound. Their genius is present in every detail of the resort: Local painter and sketch artist Mark McDowell designed, among other things, the staff name badges; pottery pro Mary VanDusen custom-made (by hand!) the restaurant’s colorful dishes; artist Janet Towbin’s vibrant geometric patterns grace multiple surfaces; and fine art printer Brent Bond’s works hang proudly in the guest rooms. One of the resort’s most Instagrammed pieces, a bright tapestry that hangs above the check-in counter in The Guest House, is by a fiber artist named Chance Phillips. Andaz Scottsdale will even arrange for you to visit these artists’ studios at Cattle Track. Being new parents whose free time is pretty much non-existent, my husband and I spent most of our day hanging (sleeping) by the pool. As I cycled between my lounge chair and the resort’s Saguaro cactus floatie, I took note of the crowd: A mash-up of families with young kids, couples, a bridal party and what I took to be a convention group...all happily swimming in laidback, sunny coexistence. The resort’s Palo Verde Spa & Apothecary, which had just opened on the day of our visit, is a light and airy space, anchored by seven treatment rooms, an outdoor hydrotherapy pool, relaxation lounges with eucalyptus steam rooms and its signature Desert Blending Bar. This is where, at the start of my True Essence Massage, I custom-blended my Body Bliss oil – a combo of citrus in arnica oil – under the expert guidance of my therapist and with the help of a specialty iPad app. Dinner at Weft & Warp Art Bar + Kitchen was a delicious end to our overnight. I could have pressed my face up to the glass of the exhibition kitchen and watched the culinary masterminds behind it work all night. Instead, we kicked back at a cozy corner table and tucked into a meal that started with charred elote, drizzled in aioli and cotija cheese, and goat cheese dumplings before moving on to whole trout grilled on the plancha with a side of blistered Shishito peppers and, naturally, finishing off with a chocolate sticky toffee cake drenched in vanilla ice cream and dates for dessert. The restaurant is named after the artistic tapestry of the Sonoran Desert – “weft” and “warp” are types of weaving structures. And so the thought behind the name is really two-fold. 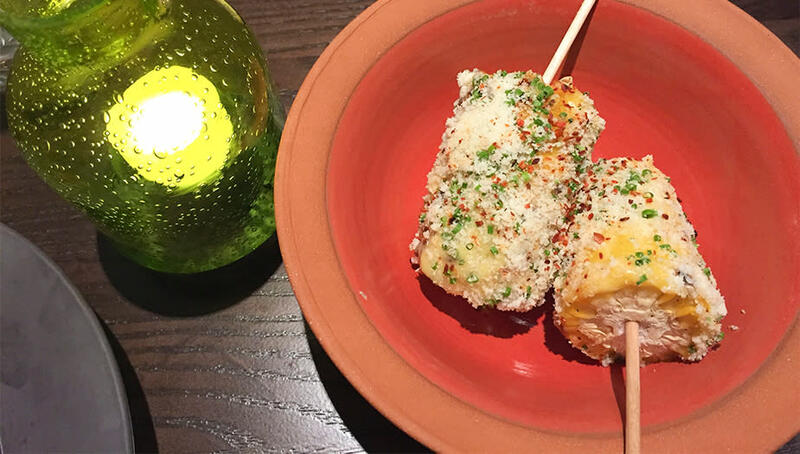 There’s a nod to area culture, of course, but it’s also a representation of Chef Adam Sheff’s menu, which plaits indigenous ingredients together with on-trend culinary techniques. Weft & Warp’s cocktail line-up takes this same approach, listing classic libations alongside more localized, specialty drinks. We loved the Fair Weather Phoenix, a bourbon-based concoction with lemon, ginger syrup and jalapeno agave, and the Mercury Mirage, made from smoked tea-infused rye whisky, chili bitters and smoked applewood. Its presentation to our table was a real show; the drink is set on fire and literally smokes as it’s being poured from the snifter into its glass. The cocktail was a perfect metaphor for the rest of the Andaz Scottsdale experience – eye-catching and cool, but with actual depth and real, bold flavor.